Our DIY Design service is for those who want the look of a professionally designed room, but also love to be hands on in the process. We provide this service whether you live in our local area, in another part of the state, or even out-of-state. All services are provided and delivered online in collaboration with you, the homeowner. 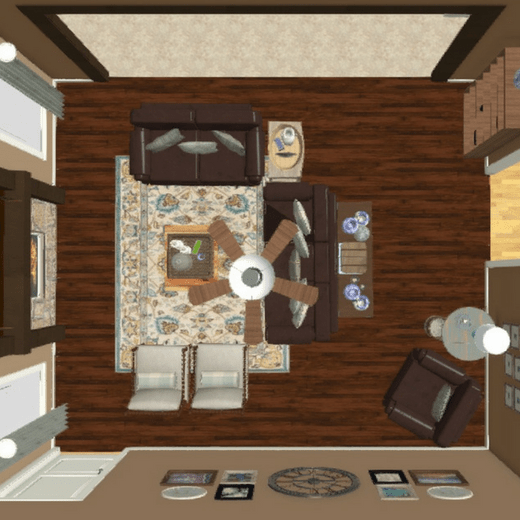 If you live anywhere in the Rio Grande Valley, we will come to your home for a two-hour Design Work Session that will include measuring the room to be designed by us. For those who live further away, we can meet through Messenger or Skype for our Design Work Session and all measurements will be provided by you (with a little help from our Room Measuring Guide). Our DIY Design Service is similar to our regular design services except for a few things. Everything is done online and by email. All products are retail and available to order online. We do not order or install anything (this is the DIY part). Pre-payment for the DIY Design Service (non-refundable). The more information you provide us about you, your family, pets, your lifestyle, likes and dislikes will help us personalize your space. We want your design to reflect who you are, what you love, and to fit your lifestyle. A personal, password protected page on our website with a link + password instructions for full access. 2D drawings of your floor plan along with furniture placement. 3D concept images of the finished room. Mood boards with images of furniture and accessory items + prices and links on where to buy them. instructions on how to put everything together. One small revision is included if requested within 14 days of receipt of your design. A full design revision will be charged at our hourly rate of $115 per hour with a minimum of 5 hours. Once payment has been received, we will send your Welcome Packet with the Interior Design Questionnaire, Letter of Agreement for services to be rendered, a Room Measuring Guide, and photography instructions. We will also need to know your budget for furniture and accessories. You will get an email each week with an update on the status of your project until we are finished with your design. You may email any questions and we will include the answers in the weekly update.